Think Your Home’s Clean? Take a 30-Day Vacuum Challenge! No one likes to think of their home as being downright dirty. A little messy from time to time, sure. (Any parent with kids will attest to that!) But most of us will vouch for the overall cleanliness of our home…while walking around with the sniffles that last from season to season, or forgetting about stale odors that we’ve just grown used to. The notion of “Oh it’s plenty clean!” especially applies to carpet and rugs. One Utah-based magazine polled their readers about their cleaning habits and found that only 39% vacuum their main living areas once a week, while about 21% vacuum less than once a week. One of the main reasons vacuuming is so important is because of all the things that have a tendency to get lodged in our carpets, rugs and upholstered furniture. Did you know a single human sheds over 1 million skin cells per hour? A household of four then could generate 16-20 million skin cells per day — and that’s just for the waking hours you spend at home! All those cells go somewhere…and many of them are great food sources for dust mites. Having a constant food supply makes your home a highly desirable place for dust mites. Regular vacuuming is also great for your carpet. The friction from dirt, dust and grit can wear down the fibers of your carpet, especially if there’s heavy traffic across the carpet, which grinds in the dirt even further. Vacuuming regularly can help retain your carpet’s color, structure and overall appearance, so you might not need to replace it as often. So taking a 30-day vacuum challenge can have a lot of positive benefits for you and your home. First, you might be amazed at how much dirt you continue to extract from your carpets and surfaces after doing it every day for 30 days. Maybe you’re missing more than you thought, or that there’s dirt you didn’t even see. And seeing is believing! Then there are the health benefits. If you feel like you’ve got 12/365 allergies, maybe what you’re really allergic to is inside your home, where you spend a good deal of every day. Removing as many trapped allergens, dust and pollen particles, dander, and dust mite feces (because yes, that’s what sets off dust mite allergies: their poop) might have a surprisingly refreshing impact on the allergy and asthma sufferers in your home. 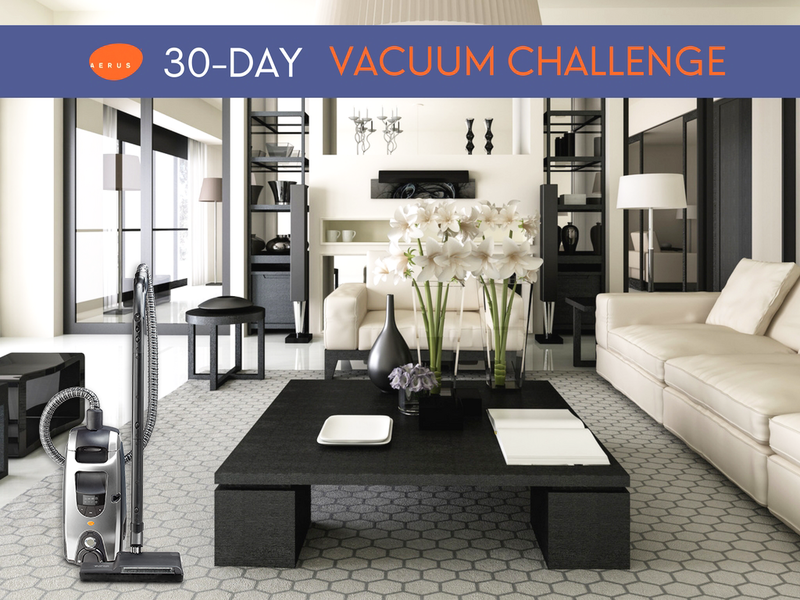 At Aerus, we think the best vacuum you can have (for a 30-day challenge and beyond!) is our Lux Guardian Platinum canister vacuum. There’s a reason it’s our best selling vacuum — it’s super-quiet and has not one but two sealed HEPA filters. The Platinum also features Automatic Operation Mode, which can sense the type of cleaning you’re performing, and its System Indicator alerts let you know the condition of operation, including suction level and automatic mode, pre-filter notification, full filter bag and over-heated motor. Knock Out Unhealthy Indoor Air With A One-Two Punch! What Happens When You Don’t Vacuum? Vacuum cleaning is one of the best cleaning as it cleans everything from every corner and is really effective. Thanks for sharing a blog about vacuum cleaning. I love vacuuming frequently because it has improved not only the longevity of my carpets but it has also enhanced the air quality of my house by removing dog hair, dust and allergens. I really liked the characteristics of your models. I will write about them in my reviews.